I had been traveling for over a week without glancing at a guidebook, so when I saw one in the hostel library I grabbed it eagerly and dove in. The addictive questions of spur-of-the-moment travel: Where am I, what kind of place do I find myself in? No hitchhiking. My heart sank with a little “blump” of annoyance. If the Book says it, then it must be true. But all it means to me is that masses of other people who read this book will be hardening their hearts, preparing not to pick me up on my inevitable hitchhiking adventures. 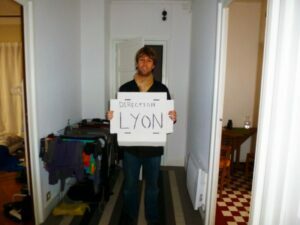 For a lot of people, hitchhiking is simply on the wrong side of a red line drawn by culture – a Do-Not-Cross line. And though I see where that perspective comes from, I think people should be informed and empowered to try their hand at this social art form: the art of using street smarts, judgment and planning to turn the raw energy of strangers’ random kindness into something with direction. 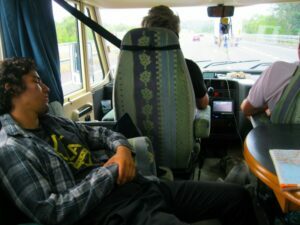 Hitchhiking has led me to the greatest conversations, the coolest tidbits of information, the most secret spots. So for those of you who are curious, interested, or just want to know what this crazy dirtbag is talking about, read on. The open road awaits! Before I launch into the heart of the matter, I need to stress: You who are reading this with pure bemusement; who are thinking: “Well, I don’t hitchhike because I’m a rational human being” – I was once like you. That is to say, I haven’t always been doing this. My mother didn’t teach me that hitchhiking was a good idea. Moreover, I am not the kind of person that jumps into things recklessly. I had my learners’ permit to drive from when I was 15 to when I was 18. I am slow to leave my comfort zone – and hitchhiking was no different. Only after websites and blogs, much like the one you’re reading now, piled on the evidence, did I start to feel comfortable undertaking longer trips. Trips in places I didn’t know as well. And I promise you that hitchhiking can be far from scary if you ease into it the same way I did: bit by bit. However, as a rational person, I also realize the flaw in my evidence. Everything in the world is safe until it’s not, and just because I’ve had lovely experiences hitchhiking in Egypt, Baja California, Peru and Eastern Europe doesn’t mean I found proof that there is no danger hitchhiking in these places. It just means I didn’t get into the one car in a million that would have resulted in a bad experience, the car that may or may not have been out there. We don’t have proof that it exists, but nor do we have proof that it doesn’t. I believe that the danger of hitchhiking is very low, for reasons I’ll outline below; but I know there is danger. So why do I keep doing it? Assuming I’m not a person who is addicted to danger, why did I become addicted to hitchhiking? To explain, let me ask some more rhetorical questions. You know when you’re a kid and you think you have the answers to all life’s problems? Like when you hear about world thirst for the first time and say, “Well why can’t we just drink the sea?” Or you see a homeless person and you say, “Why can’t everyone just give him their leftovers?” And when you start to grasp all the petty little reasons why not, it’s just this crushing awakening to how stupid and confusing and wasteful the world is? To me, the idea of how difficult and expensive travel is is one of those little frustrations: Why must I pay so much for a plane ticket when the plane is going anyway? And to hitchhike is to give a great big middle finger to all those little assumptions that clutter up the world and make childlike logic impossible. It is to say, All these cars are going where I’m going and they’re empty, and you know what, there is something I can do about that. It is to say, Hey world, guess what – there is enough water on the planet, we can drink the sea. It is a triumph of childlike wonder, and it is a call not to waste energy that is already being expended. So let’s go straight to the million-dollar question: But is it safe? There is a lot I could say about this, and as I said earlier, none of it is a guarantee of safety. But here are some basic points that should add up to, if not a guarantee, then a more balanced picture. 1. As the one entering the car, you have the power. You have to be trusting to hitchhike, but the person who was already on their way safely in their own car has taken an even bigger leap of faith to trust you. Should any altercation occur, remember that that person has their hands occupied driving the car, while you have your hands free. A driver, even one who would consider a crime of whim like sexual assault, is responsible for his life and his car while he’s driving, not just your life. 2. Hitchhiking is not a viable avenue for premeditated crime. The nightmare-cliche of the Hitchhiking Murderer is essentially flawed because there just aren’t enough hitchhikers. To be planning a Hitchhiking Murder, you have to be planning to run into hitchhikers. When you’re hitchhiking from city to city, there’s no way for people of ill intent to be “waiting for you” or “find you”, because nobody expects to run into you. Everybody you interact with on the road, regardless of whether they are potentially violent or not, will be bemused and surprised folks who were going about their business before they saw you and have business to go about once they drop you off. 3. You can always refuse to get into the car. The majority of people that pick you up will be lovely, well-adjusted and personable. And I promise you that if you cultivate a little patience, you will find enough rides that you don’t have to settle for anything less. If for a second you get a bad vibe from a driver – be it someone whose language you don’t speak comfortably, a man who seems a little too interested in a woman hitchhiker, or someone who doesn’t want to give you information about where they’re going – saying “no, thank you” is always an option. 4. 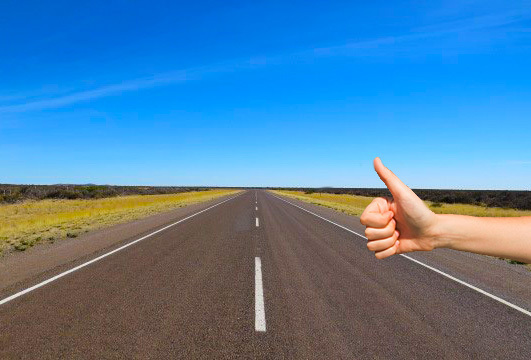 The majority of hitchhiking crimes occur on small stretches within cities. This is a statistic I read a while ago in an excellent, well-researched article by a guy named Bernd Wechner. At the time of this writing, it sadly seems to have disappeared from the Internet. So you’ll have to just arm yourself with a grain of salt and take my word about his statistics, because there’s nothing really similar to be found, but they were so influential to my early education as a hitchhiker that I can’t omit them. If you’re interested in verifying, there’s a mention of his article here, on the site HitchWiki. Hopefully, the community there will get wind of it, and it’ll appear on that page, if Wechner ever makes his article available again. Anyway, Wechner listed a few good reasons for why hitching from place to place on the road is overwhelmingly not the source of hitchhiking-related crimes. One is that directions in cities are haphazard, and going anywhere involves driving around a lot. That means that it’s easier for a criminal-on-a-whim to whisk you to an empty parking lot or other sketchy location, and harder for you to tell if you’re on the right track or you’re being whisked. Travelers are predictable; on a highway there’s a firmly-understood etiquette of where you expect to go. These sound like factors that make escape from a criminal easy, but as it plays out, they’re really just factors that deter criminals from trying anything. The bigger point, though – and the statistic of Wechner’s that I most sorely wish I could find – is that even among the hitchhiking injuries, deaths or other incidents that occur in cities, the majority are the result of car accidents and not of malicious crime. You can probably imagine why this is: you’re hitching home from a party, the driver was at the same party, etc. In other words, the most dangerous part of hitchhiking is simply due to the dangers of driving. As a male, there’s not much I can say to this which has credibility, because I don’t share your experience. However, I can tell you that I have met plenty of girls who hitchhike. Reports from them that I’ve heard are overwhelmingly positive, saying that people are often more generous and, ironically, protective due to their fear for your safety as a woman hitchhiker. Moreover, women are often perceived as less of a threat by hitchhikees who are not seasoned traveling vagabonds. You have a chance to be picked up by white-collar people who are skittish about picking people up because of the same stories that made you skittish to get on the road. There are, of course, more safety precautions that women will have to keep in their mind – how far away is nightfall, do I speak the language, et cetera. And as with anyone of any gender, no matter how high I pile the evidence that something is safe and OK, I don’t wish to pressure or challenge any of the ladies out there, or give flack to those who don’t feel like taking the leap of faith is for them. But if you’re a woman reading this, thinking it sounds like it’s for you, but at the same time cursing the patriarchy because you just know that hitchhiking is not safe – all I suggest is that you read on anyway, especially to arm yourself with the safety strategies below. Beyond that, I can only pass the mic to a female voice, found in this meaty article (also a fantastic read for any gender). With all of this said, here are some simple tips on how to stay safe. I won’t get into any elaborate escape schemes, and I will stress one more time that you probably won’t need most of those. But it’s always important to load up your arsenal of street smarts before doing something as unpredictable as hitching. -Ask where someone is going before you say where you’re going. That way you eliminate the danger of people simply telling you what you want to hear. If you’re carrying a sign it obviously narrows your options here, but you can still demand a detail – “what part of La Paz are you going to?” – that is an easy, quick sincerity checker. If you don’t like someone’s vibe but you want to avoid the awkwardness of a flat-out no, you can always just say oops – that’s not where you’re going, thanks. -Avoid hitching at night. I take this as a soft rule, but it is simply something to keep in your mind, and it could probably be a hard rule for lady hitchhikers. Nighttime, obviously, brings more dangers. That just means you will need to make decisions differently, and plan your day with that night in mind. I would only hitch at night if it was in a very patrolled area, like a rest stop with lots of trucks and drivers, or a town whose main street is right along the highway. -Stay safe from traffic. Only a pretty crappy spot will put you directly on a fast highway, but those spots sometimes can’t be avoided. It may seem obvious, but keep the physical power of cars in mind. Cross streets carefully, make yourself visible, and don’t stand on narrow shoulders. In California at least, this is the motivation for hitchhiking being illegal – and if you’re not actually standing on the asphalt of the road, you’re technically not breaking the law. Read up or ask around about the laws where you’re going, and if you’re breaking them and you run into police, play dumb. -Keep your stuff handy once in the car. Don’t put your backpack somewhere inaccessible, like in the trunk, upon first getting into a car. Having it at your feet, even if it’s an unwieldy external-frame monster, makes you ready for a quick escape. You probably won’t need to make a quick escape – but the point is to send the message that you’re ready to get out of the car at any time. -In case of an emergency, be firm and pretend you’re about to vomit. The guide for women hitchhikers linked to above gives a lot more details about what to do in case of a turn for the worse, and how exactly you can manipulate a conversation or interaction. But in lieu of a longer discussion, this trick is my favorite. One of my best friends, who is a lady that hitchhikes, used the “I’m-gonna-vomit!” trick to get out of what sounded like a very sketchy situation (though luckily we’ll never know for sure). Just have some kind of fib up your sleeve, and don’t underestimate the power of insistence and cleverness even to get yourself out of real danger. The bottom line is that hitchhiking is no more or less safe than any activity that puts you in public, where you don’t know what people are up to. Just like when you’re in public anywhere else, you have an arsenal of social tools to react to a sour situation, long before it becomes a dangerous one and then an emergency. With all of that said, it’s time to move on to the fun stuff. THE BASICS: WHAT MAKES A GOOD SPOT? The key to hitchhiking is predicting where people are going. More than that, it’s predicting exactly what spots people drive past on their way to get there. In your hometown this can be simple; in a strange new city, where you’ve been taking buses everywhere and do not understand the freeway system… not so much. Your greatest resource is other people. Once you get picked up by one car, you will more likely than not enter a secret in-club of Cars That Pick Up Hitchhikers. Often these people have hitchhiked themselves, and/or have picked up hitchhikers in their area before. So wherever their next destination is, they’ll know where to drop you off for a ride. But before you get that magical first ride, other people can be tapped as well. Your couchsurfing host or the receptionist of your hostel will probably be bemused when you announce your plans, but they also probably know where the entrance to the freeway is. You may need to get oriented on a map to ask the right questions. And once you figure out where cars are going, generally… you still need to find the perfect spot. Stand where there’s only one way to go. Big cities and metropolitan areas are the bane of hitchhikers, since even if you pick a direction, fellow travelers will be watered down among urban commuters getting on the next freeway to go the other direction. Even those that pass by may be unable to stop safely for you, mired in many-laned traffic. Generally, a hitchhiking journey starting from a big city begins with a subway or bus ride to some spot on the outskirts of town, just far enough for the local urban traffic to be cut down. The maps section of Hitchwiki (linked at the end of this article) is indispensable for finding spots like this, though it’s woefully Eurocentric. If you can’t find any quick tips on the city you’re trying to escape from, I recommend just grabbing a half-hour bus ride to the closest middle-of-nowhere along the highway you want to follow. Stand where you can be seen. You want to be visible for the greatest amount of time possible before the drivers reach you, so they have a moment to consider whether or not they want to pick you up. Gas station exit lanes are also great for this, since your potential hitchhikees are wondering guiltily “should I…?” the whole time they’re filling up or grabbing a snack in the store. Stand where cars can stop safely. This is perhaps the most important – not just for safety, but just for your chances of being picked up. All you need to do is put yourself in the driver’s shoes. Would you screech to a halt at 70mph to pick you up? Freeway on-ramps are better than freeways themselves, but you have to make sure that you can be seen from a ways away (especially if the ramp is a curve), and that there’s a safe stopping lane. Freeway onramps with traffic lights are excellent. Anywhere with a bus stop is even better. If you’re in Europe or somewhere else with roundabouts, avoid them – there’s too much pressure on drivers already to look for their exit quickly and keep traffic moving in the roundabout. The best spots of all are toll stations or police checkpoints, where every driver on a main road, like a highway, has to slow down to a safe stopping speed, right at a point where there are built-in pull-out areas. I would suggest standing after the toll station itself. Don’t shy away from police checkpoints; just ask first if the police mind. Sometimes police in developing countries with strongly community-based cultures will actually stop cars, ask where they’re going, and ask if they can take you. It’s only ever happened to me once (in Egypt), but the stories are out there about Mexico and all sorts of places. While you’re out there waiting, remember to look back! Even if you plan your spot well, oftentimes people will come screeching to a halt 80 feet down the road from you, because they just didn’t think fast enough. In light of this, standing even a little ways before a good pullout, rather than right next to it, is not a bad idea. The final basic principle is patience. This is not 1965, and there are places where you may have to wait a while. It depends on the culture of the place as much as the amount of traffic passing a spot and how well the spot was chosen. The mantra is that there is always someone who will pick you up – the question is how long you will have to wait. If and when you decide to stop hitching for the day and try something else, it won’t be because you’ve “given up” – but rather because you know how long of a wait the saved bus money is worth it to you. You can get everywhere using hitching only, but filling in the last few gaps of truly difficult jumps could take exponentially more waiting and require more uncomfortable dirtbaggery, like sleeping in the woods near the highway. If you’re a traveler with a reasonable budget and a job back home, it probably won’t make sense to hitch everywhere. Sometimes it’s best to just cut your losses and fill in a key stretch with a bus ticket. With that said, empower yourself to be patient with the knowledge that someone always comes eventually. Just be patient until it’s no longer practical or enjoyable, a personal threshold that is different for every situation, and that you’ll have to find for yourself. The sign: can work either in your favor or against, but is usually a good idea. Get an old piece of cardboard from a Dumpster and write in big, clear letters with Sharpie. If you’re on a long trip, though, expect to go through one sign for every major town along the way – a sign for a faraway city will scare off people who are just going to the next town, and don’t realize how much that will help you. A smiley face or a sign in the local language (if you speak it) are good ways to set a good first impression already. Even in Baja California, where there’s only one highway, I felt better carrying a big sign that only said “SUR”. The message: I speak at least a bit of your language, and I am the kind of person with a destination and a plan. The look: I am a big hairy male, so I have spent a lot of thought on whether my efforts to look friendly and lovable actually make a difference. I’ll probably never know for sure, but I always try to keep it in mind. Shaving is a must. Sunglasses are a minus (no eye contact), unless I’m squinting straight into the sun. In wintry Europe, where black leather gloves are a pretty basic male clothing item to keep warm, I made an effort to show a friendly, bare thumb whenever a clump of cars passed. To my Californian eyes, black leather gloves just look murdery. It’s probably the silliest thing I’ve done, but you get the idea – and you can make your own judgments about how you want to appear. Most of all, smile! Again, I have no idea if this actually helps, but it never hurts to sow some good vibes. I’ve heard people swear by “groovehiking”, where you incorporate the thumb into dance moves, etc. But again, that’ll be part of your own personal style. Hey-Mistering: This is not my style, but some of the more gung-ho hitchhikers I’ve talked to like to chill at gas stations or truck stops and politely ask for rides. Don’t be afraid of intruding: people aren’t afraid to say “no”. And there do exist nice people, that are down to take you, who open up like a jack-in-the-box as soon as you ask – and would have passed you by otherwise. So this method is worth a try. It takes a lot more energy and social skills, but it brings results in otherwise nigh-unhitchable places. This will be especially key for you if you’re traveling in a group: a group of 2 or 3, especially 3 guys, won’t invite anyone to stop traffic. But a polite young man striking up a conversation and then politely asking if there’s room for 3? Your chances just got much better. If you decide to go this route, here’s the strategy. Buy a good map of the area, or even an atlas, and walk over to someone getting gas – not to ask if you can get a ride, but to ask them where you are on the map. Harmless conversation, not intrusive at all. Be friendly. Deciphering a map is a team activity; it brings you together. Then point out the city you’re trying to get to – Oh, it must be this way. Only when you’ve already had a somewhat wrapped-in-a-bow, positive interaction, need you add (if the vibe feels right), “Are you going anywhere near there?” It sounds conniving, but people will say “no” if they want to. And honestly, it makes the conversation more comfortable for you and for the potential hitchhikee. If the map thing doesn’t work for you, cook up an icebreaker that does – smokers can ask for a light, etc. The other thing to keep in mind – which may be considered more conniving or less, depending on your perspective – is that in a group with multiple genders, the girl might consider going on the front lines of holding out the thumb or striking up a conversation. Do with this suggestion what you will. If you want to know more, Hitchwiki is the most comprehensive hitchhiking site on the Web by far, with both entries about cities and areas and an incredible maps section. The link is here. Similarly, this Wikitravel page has a much, much longer list of tips for safety, and for being picked up, similar to the ones I’ve included. Finally, in case you lost track of the link I provided in the text, this article has it all for potential lady hitchhikers, or those who want to learn more about safety through feminist eyes. It takes two to get a hitchhiker across the country. When you take up this stigmatized and disappearing art, you are representing the community of hitchhikers. So don’t forget to create a happy hitchhikee, who will pick up someone else someday! Be polite, don’t ask for a ride out of someone’s way, try to avoid bathroom breaks, offer a snack, and most importantly, chat. That’s probably why they picked you up, and it’s the social contract you enter when you hitchhike: You get a free ride; the driver gets to escape an otherwise-boring day and instead be part of your adventure. So be yourself, start a conversation, and have fun! The road awaits, but as any hitchhiker knows, it’s not the road that calls us to travel- it’s the people in it. I'm an aspiring writer with a bachelor degree in linguistics. No, linguists don't all speak many languages; but yes, I speak four and a half. My passion for languages is only the beginning of the curiosity for new landscapes, cultures and stories that pushes me to wander this world. I've never found a place I love quite as much as my homeland of Northern California, but the search continues - as does the search for the perfect taco (the best one so far was in a place called Camalú, in case you're wondering). I hope my contributions help make this little blog a worthwhile stop on your own journey! Great article Ben. 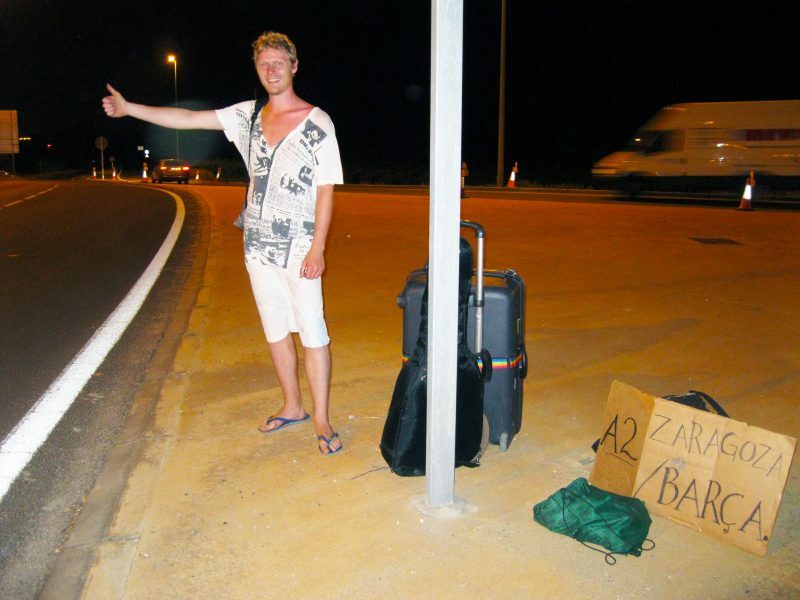 As a solo female traveler I’ve always been a bit hesitant to hitchhike alone. I did briefly hitchhike a short distance with a male friend and was not concerned. But reading this has given me many tips on how to maximize the experience, stay safe and try it solo at least once!